It is perhaps the travesty of our times that the definition of ‘secularism’ has been distorted beyond recognition. What once merely used to mean the separation of religion and state, has morphed into a political tool to not only appease the minorities into voting as a block for one particular “secular” party, but also for a party which can offend the majority more effectively. BJP is of course considered a majoritarian, anti-minority particularly anti-muslim party in spite of their motto of “sabka saath sabka vikas,” simply because it refuses to appease the minority and trample upon the majority. Congress has always played politics of minority (Muslim) appeasement in the name of secularism. Specially after Narendra Modi became CM of Gujarat in 2002. And this time, Congress managed to up its vote share from 38% in 2002 to almost 41% in 2017. Last year BJP government faced the storm of agitation by the affluent Patidar community demanding reservation. Patidars have been traditional BJP supporters but BJP couldn’t fulfill their demand because of constitutional limitations. Sensing the mood of Gujarat, Congress ditched their muslim appeasement agenda to woo angry Patidars. It promised them reservation and adopted “Soft Hindutva”. Rahul Gandhi visited several temples during his campaign and even was declared as a Janeudhari Shiv Bhakt. This ‘soft Hindutva’ approach of Congress was amusing to many. This was the same Congress which was perceived to be anti majority their approach, whose Prime Minister Manmohan Singh had once declared that muslims had the first right on national resources. The same Congress housed leaders who concocted the ‘Hindu Terror’ bogey. Thus, this U-Turn seemed very interesting. It was also initially reported that because of Congress’ new found love for Hindutva, the Muslim voters of Gujarat were not only disgruntled with the Congress party but may also abandon them in the Gujarat Elections. However, voting patterns in the Electoral process often need closer analysis to understand whether the available data backs up such sweeping generalizations and electoral claims. Muslims account for almost 10% of Gujarat’s population. There are 34 assembly seats in Gujarat where Muslims constituents more than 15% of vote share and to understand how they voted, we must look at the candidates and how the votes were cast in favour of those candidates in at least a few constituencies. One of the ways to ascertain this, is to see if Muslims backed non Congress candidates. This constituency has about 58,000 muslim voters who constitute about 29% of the voters. This is how this constituency voted. 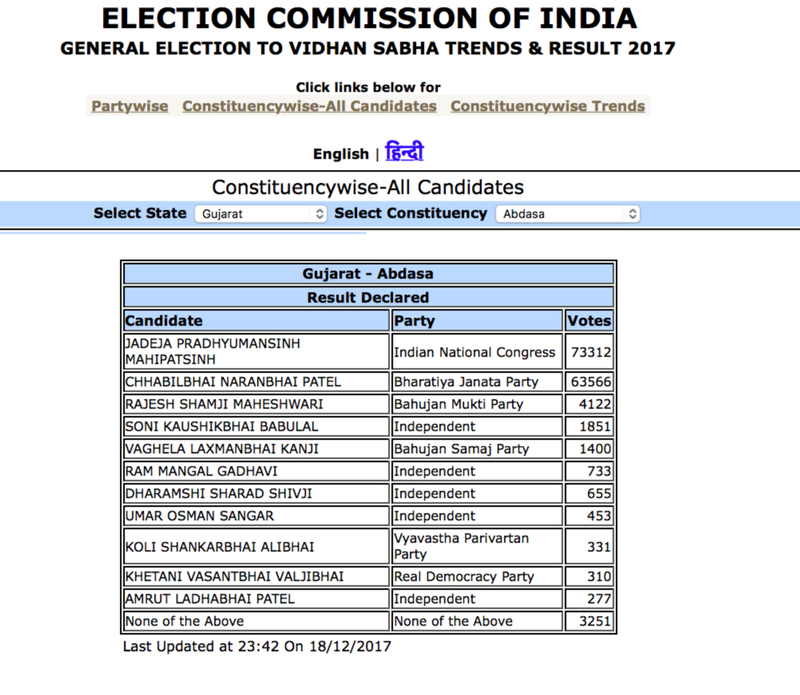 The Congress candidate Jadeja Pradhyumansinh Mahipatsingh won with 73312 votes to him name while an independent Muslim candidate, Umar Osman Sangar, polled only 453 votes. Interestingly, despite theories of ‘muslims angry with Congress’, the party managed to increase its win margin since in 2014, Congress candidate Shaktisinh Gohil had won with a mere margin of 700 votes. It is thus evident, that while Muslims may have been disgruntled with Congress, they have still voted for Congress heavily, abandoning even the Independent muslim candidate. The total voter base is 2.24 lakhs and more than 50,000 voters are Muslim. Almost 24% of voter base. 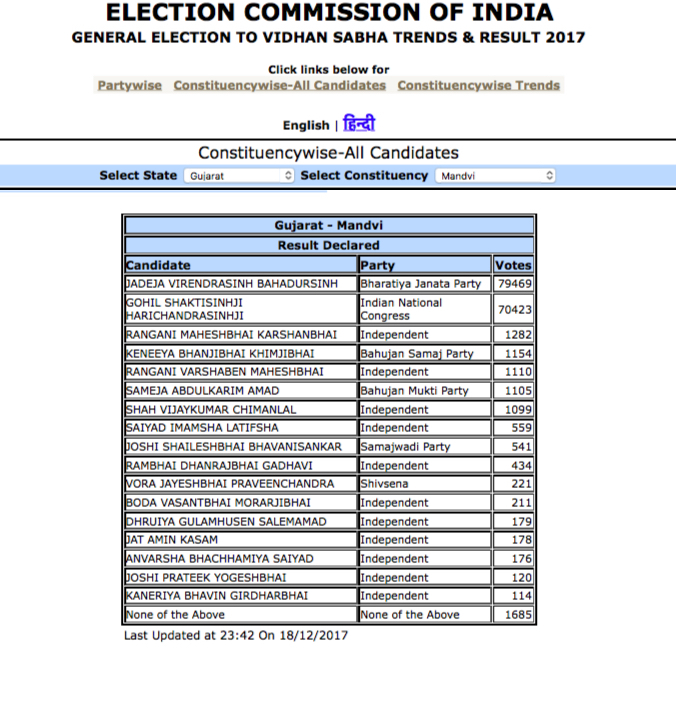 Here BJP’s Virendra Singh Jadeja won but Congress’ Shakti Sinh Gohil got 70423 votes while 3 other Muslim candidates got 1105, 559 and 178 votes only. This constituency, other than the 50,000 muslim voters has about 31,000 Dalits, 25,000 Patidars and 21,000 Rajputs voters. While it would seem like BJP managed to defeat Patidar anger and rope in Dalit and Rajput voters, it would also seem like the Muslim voters have stood by Congress, abandoning even the 3 Muslim candidates. Total voters here were almost 2.50 lakhs with more than 90000 Muslim voters. Almost 36% of voter base. 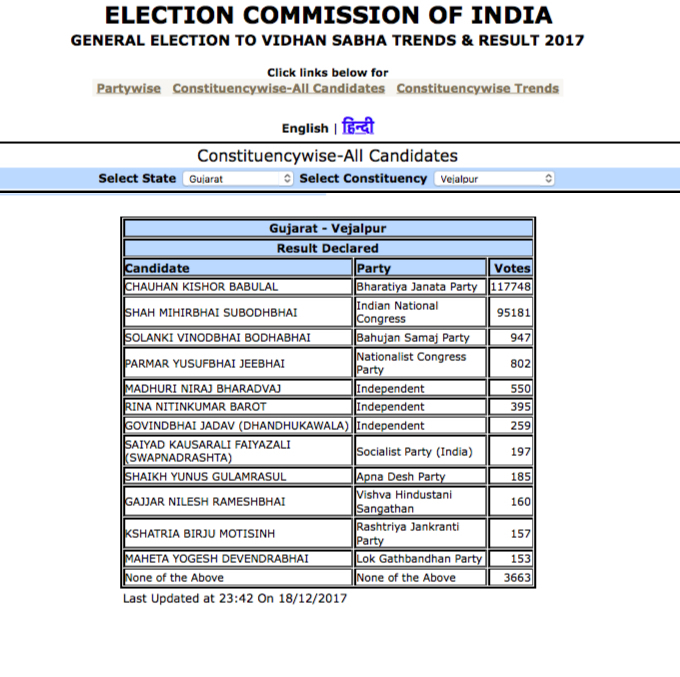 Congress candidate got 95181 votes while 2 Muslim candidates Saiyad Kausarali Faiyazali and Shaikh Yunus Ghulam Rasul won only 197 and 185 votes respectively. The Lok Sabha constituency has around 1.4 lakh Muslim votes, of which 90,000 live in Vejalpur Assembly seat, covering Juhapura and Sarkhej areas. While BJP won in this constituency by polling 117748 votes, it is seen that the muslim candidates did terribly while Congress, coming in second, polled 95181 votes. 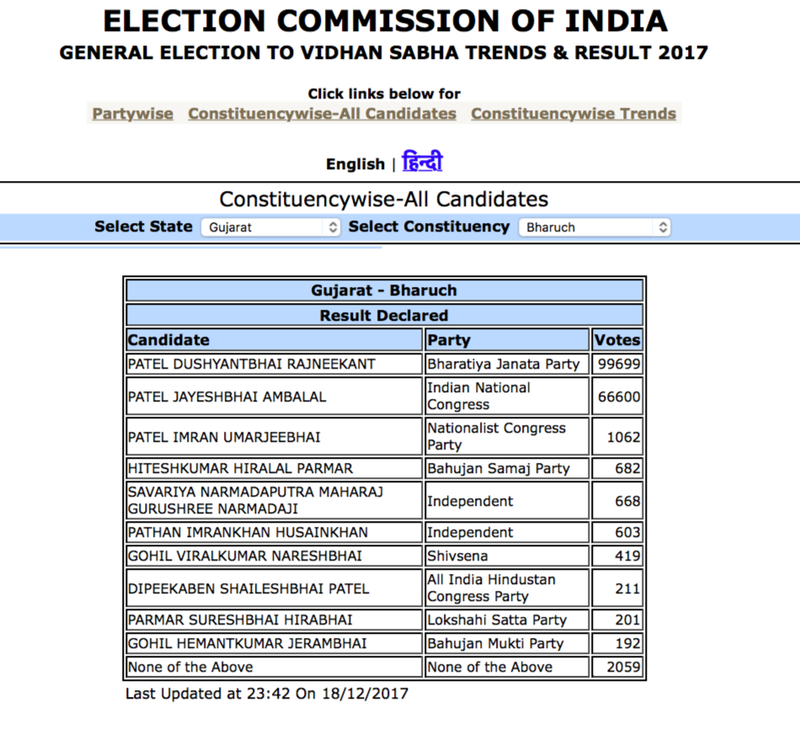 In Bharuch which has almost 38% of muslim vote share of total 2.4 lakh votes, Congress’ Jayesh bhai Patel got 66600 votes and only muslim candidate Patel Imran got 1062 votes. These are of course just a few examples, but while it may seem like since BJP is winning in some Muslim majority areas, that Muslims might be voting for BJP, numbers seem to point to the fact that the Muslims have rallied behind Congress yet again. According to polling agency VDP Associates, almost 88% Muslims voted for congress. There might have been marginal muslim votes that might have gone to BJP, but despite the widespread narrative of muslims being angry with Congress, they have, in most constituencies, abandoned even independent muslim candidates in their favour. While Congress did peddle their ‘soft hindutva’ stand, it was also believed that perhaps the Congress party raked up a storm by having Rahul’s name in the ‘non hindu’ register of the Somnath Temple to try to not lose its minority voter base, and if numbers are to be believed, their methods seem to have worked. It would seem like BJP won due to Hindu consolidation and Congress seems to have not only retained its minority share, but also managed to divide the Hindu vote to favour them in certain areas. This might also explain the reduction in BJP’s seat share. Muslims backed Congress in 2012, and despite Rahul Gandhi’s soft Hindutva approach, they seem to have backed Congress in 2017 yet again.